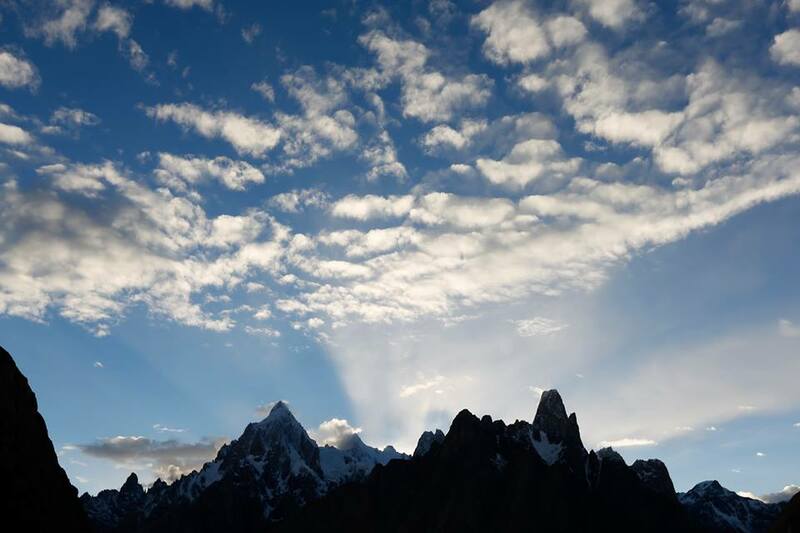 The Trango Towers are a group of dramatic granite spires located on the north side of the Baltoro Glacier, in Baltistan, a district of the Gilgit-Baltistan region of Pakistan (formerly Northern Areas). 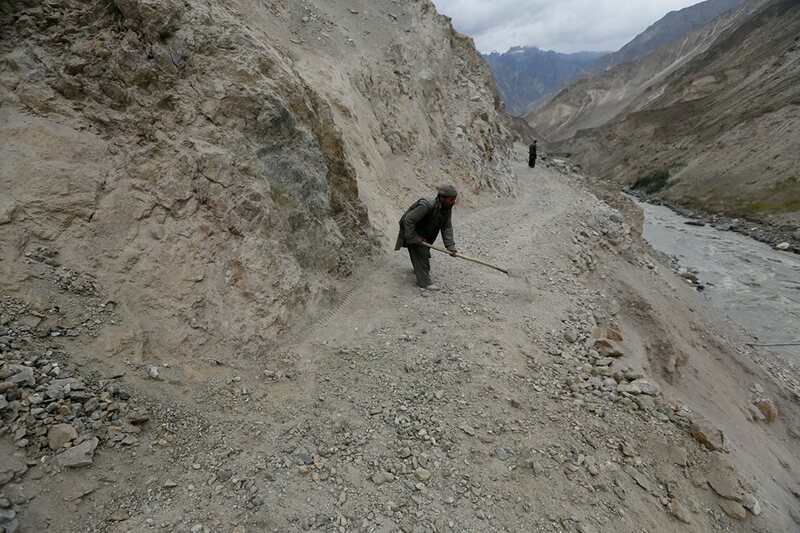 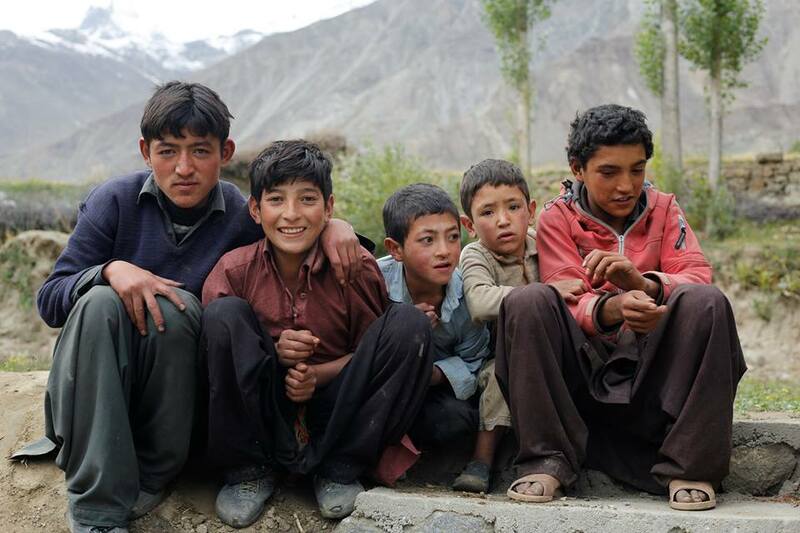 They are part of the Baltoro Muztagh, a subrange of the Karakoram range. 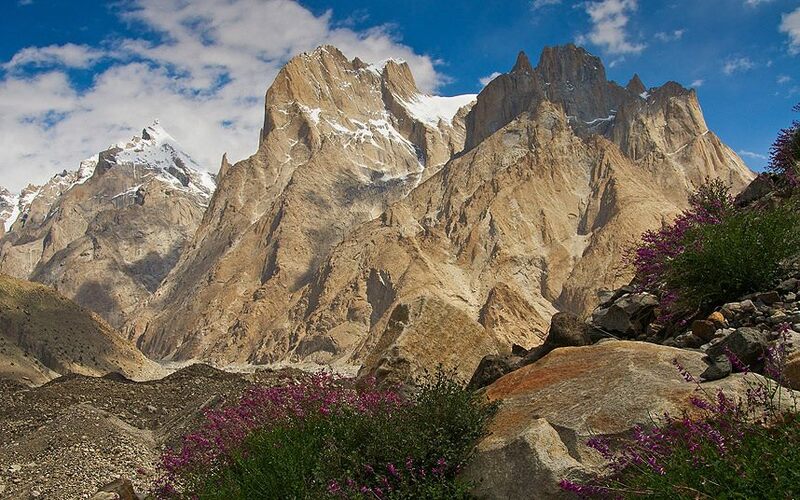 The Towers offer some of the largest cliffs and most challenging rock climbing in the world. 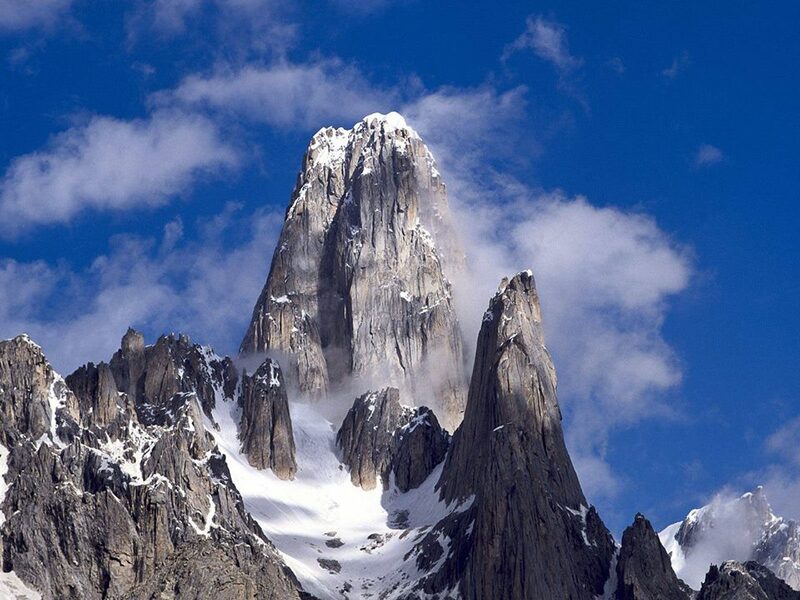 The highest point in the group is the summit of Great Trango Tower at 6,286 m (20,608 ft). 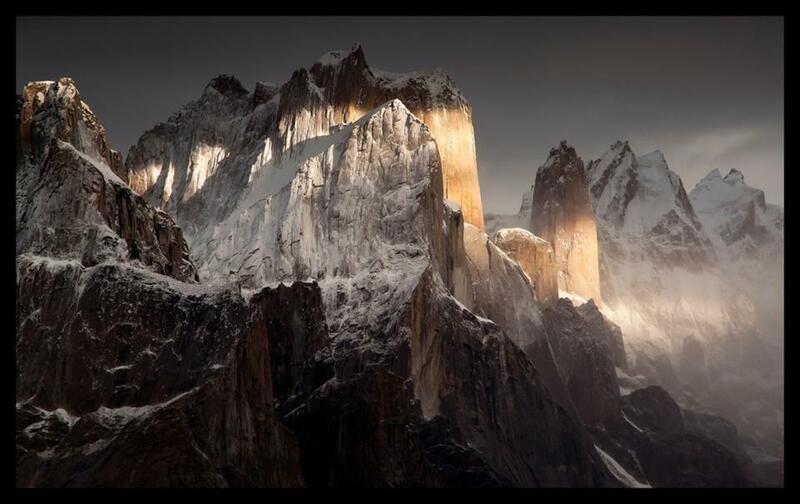 The east face of the Great Trango Tower features the world’s greatest nearly vertical drop. 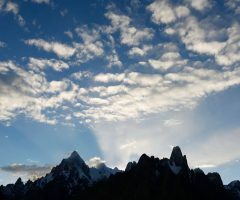 All of the Trango Towers lie on a ridge, trending northwest-southeast, between the Trango Glacier on the west and the Dunge Glacier on the east. 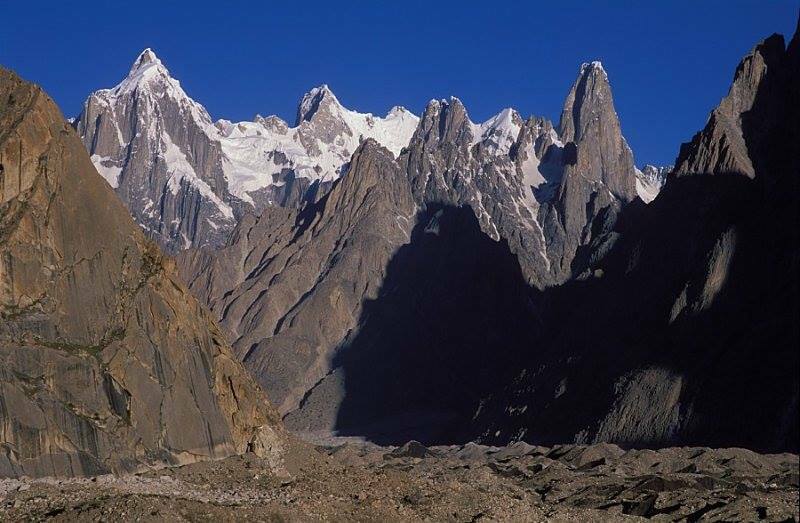 Great Trango itself is a large massif, with four identifiable summits: Main (6,286 m), South or Southwest (circa 6,250 m), East (6,231 m), and West (6,223 m). 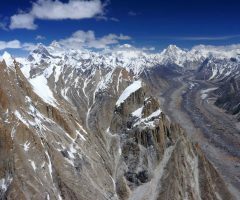 It is a complex combination of steep snow/ice gullies, steeper rock faces, and vertical to overhanging headwalls, topped by a snowy ridge system. 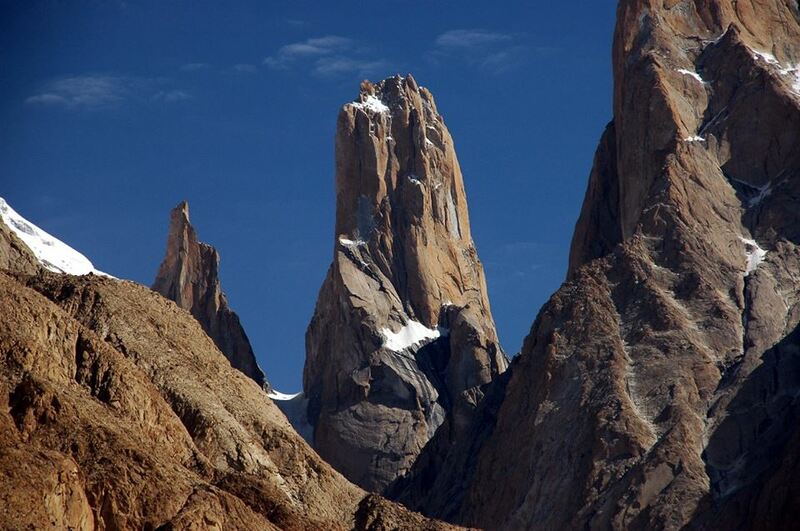 Just northwest of Great Trango is the Trango Tower (6,239 m), often called “Nameless Tower”. 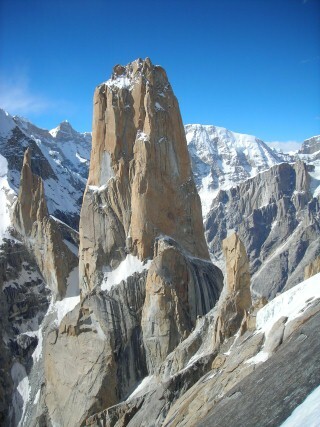 This is a very large, pointed, rather symmetrical spire which juts 1000 m out of the ridgeline. 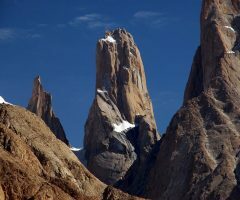 North of Trango Tower is a smaller rock spire known as “Trango Monk.” To the north of this feature, the ridge becomes less rocky and loses the large granite walls that distinguish the Trango Towers group and make them so attractive to climbers; however the summits do get higher. 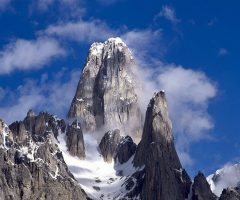 These summits are not usually considered part of the Trango Towers group, though they share the Trango name. 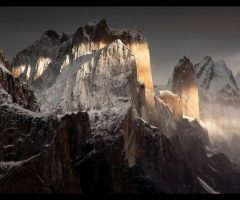 Trango II (6,327 m) lies northwest of the Monk, and the highest summit on the ridge, Trango Ri (6,363 m), lies northwest of Trango II. 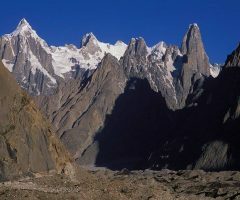 Just southeast of Great Trango (really a part of its southeast ridge) is the Trango Pulpit (6,050m), whose walls present similar climbing challenges to those of Great Trango itself. 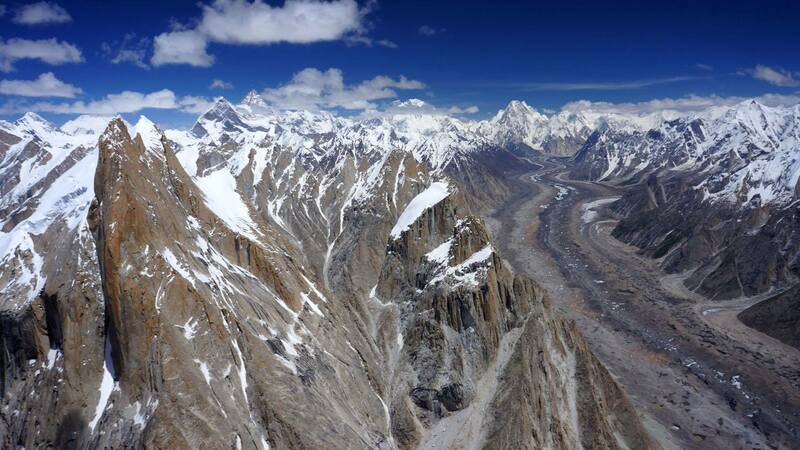 Further to the south is Trango Castle (5,753 m), the last large peak along the ridge before the Baltoro Glacier. 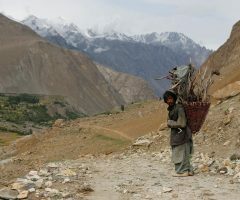 Day 01 : Arrive in Islamabad received and transfer to hotel. 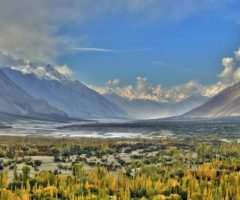 Afternoon city tour of Rawalpindi & Islamabad. 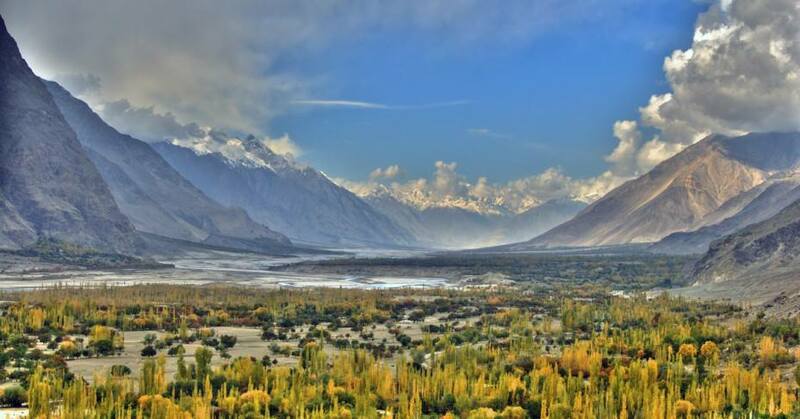 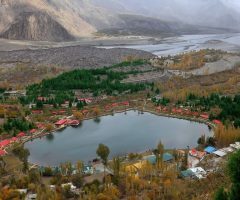 Day 02 : Fly Islamabad to Skardu or drives to Chilas on KKH. 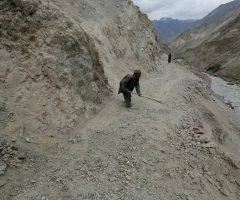 Day 04 : Drive to to Askole. 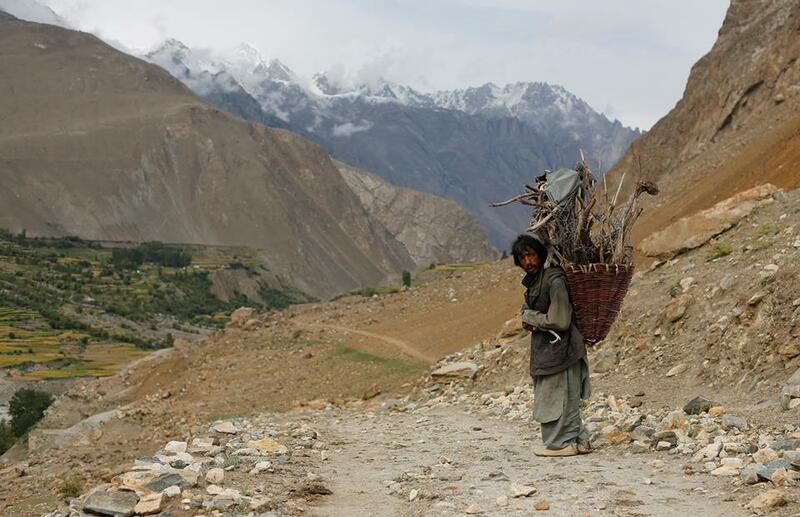 Day 06 : Trek to Paiju. 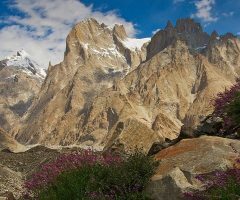 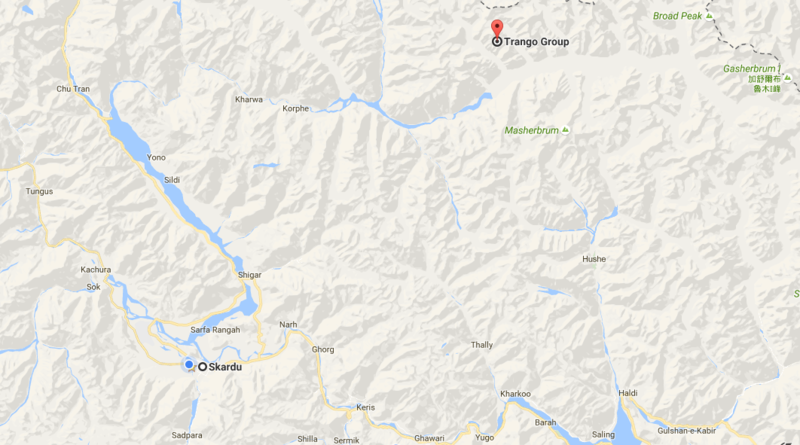 Day 07: Trek to Trango Base camp. 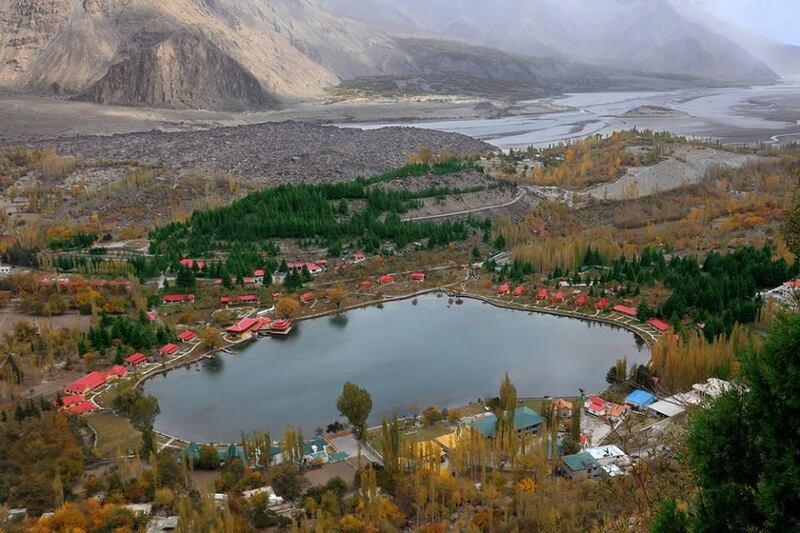 Day 38: Fly to Islamabad/Drive to Chilas through KKH.